Chief Engineer (PHE) Water, Assam invited application for Junior Assistant (LDA). - Jobs4NE : Jobs in Assam and North East India. 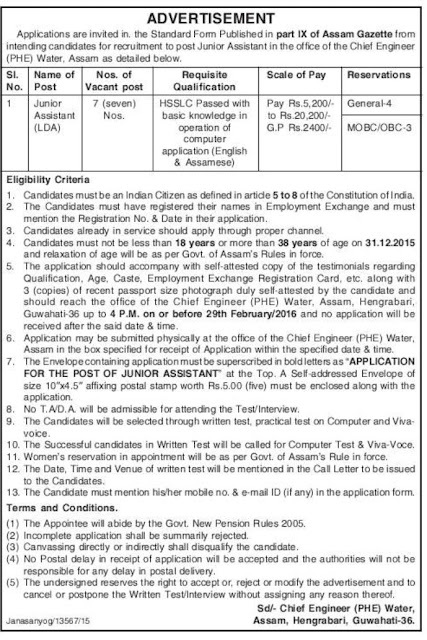 Chief Engineer (PHE) Water, Assam invited application for Junior Assistant (LDA). Applications are invited in. the Standard Form Published in part IX of Assam Gazette from intending candidates for recruitment to post Junior Assistant in the office of the Chief Engineer (PHE) Water, Assam. Age limit: Candidates must not be less than 18 years or more than 38 years of age on 31.12.2015 and relaxation of age will be as per Govt of Assam’s Rules in force. How to apply: The application should accompany with self-attested copy of the testimonials regarding Qualification, Age, Caste, Employment Exchange Registration Card, etc. along with 3 (copies) of recent passport size photograph duly self-attested by the candidate and should reach the office of the Chief Engineer (PHE) Water, Assam, Hengrabari, Guwahati-36 up to 4 P.M. on or before 29th February/2016 and no application will be received after the said date & time. Application may be submitted physically at the office of the Chief Engineer (PHE) Water, Assam in the box specified for receipt of Application within the specified date & time. The Envelope containing application must be superscribed in bold letters as “APPLICATION FOR THE POST OF JUNIOR ASSISTANT' at the Top. A Self-addressed Envelope of size 10"x4.5" affixing postal stamp worth Rs.5.00 . (five) must be enclosed along with the application.